Alaska is a photographer's dream - from wide angle to telephoto, shooting film, video or digital, with subjects ranging from wildflowers to wolverines, mountain ranges to mid-night sunsets. The photo opportunities are endless. You will not want to run out of film and/or batteries, and you will most definitely return home with pictures suitable for framing, ready to hang on your wall. The "golden hour" is stretched in Alaska during the summer months, especially further north in Denali National Park. This is the hour just after sunrise and just before sunset when softer horizontal sunlight casts a "golden glow" over the landscape and photographed subjects, and longer shadows saturate scenes. Above 63 degrees north latitude in the park the sun hugs the horizon for hours in the AM and hours in the PM as if it never is going to set...and it almost doesn't. When the weather is fair, attractive photographic lighting is naturally prolonged in this part of the country at this time of year. Northern latitudes also improve one's visibility over long distances by having lower "tree lines" on hills and mountains. In New Hampshire at 43 degrees north latitude tree lines begin above 4000' elevations. 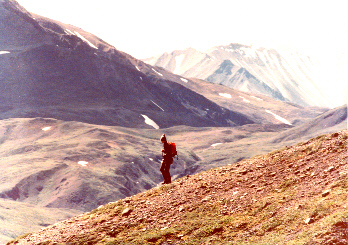 In Denali National Park, where tundra vegetation predominates, and elevations are relatively low (valleys may be treeless, except a few patches of spruce, at 2000' in elevation), this open landscape allows one to more easily see rock outcrops and geologic forms and patterns, wildlife trails in the tundra, and individual animal and herd movement locations, plus wildflower patches, snow fields and glaciers, and braided rivers that seem to flow endlessly from one horizon to the next. These are photo ops enhanced by a treeless landscape. Trees cannot "block the view." Though to be perfectly fair, where the environment is less hostile to tree survivability and elevations are lower, trees are the view. Telephoto lenses from 200mm to 400mm can be important in order to bring wild subjects "closer" to the photographer without infringing on wild animal territories. This is especially true for large predators, moose, and animals with young. 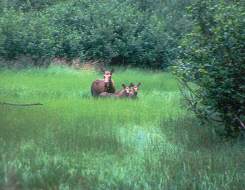 Moose in particular are known to be unpredictable and dangerous when their territories appear threatened. Photo equipment varies considerably and ultimately your preferences should be guided by what you won't mind lugging around on your back. Practicality and photographic enthusiasm need to be well balanced. With a little skill and a lot of luck you will be a able to get those once-in-a-lifetime shots in Alaska.